Did you know that 88 women have graduated from Emerge Maryland’s unique candidate training program since 2013? Did you know that 60% of our graduates are women of color? Did you know that our alumnae are serving in elected offices all over Maryland? 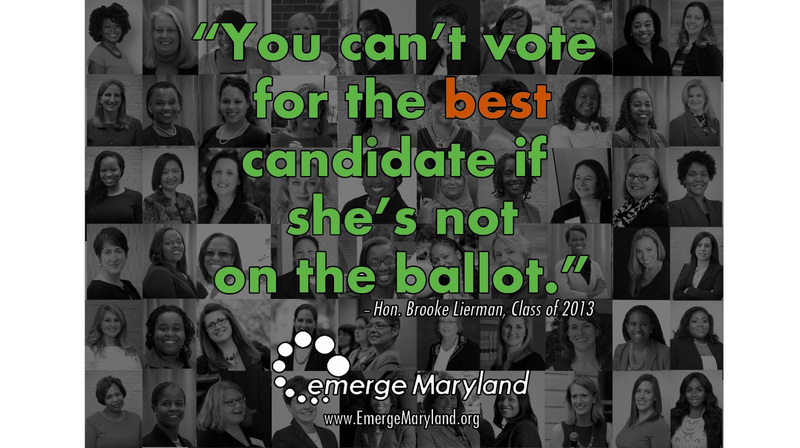 Emerge Maryland is changing the face of Maryland politics by identifying, training and encouraging women to run for office, get elected and/or to seek higher office. Our intensive, cohort-based 7-month training program is unique. As the number of elected Democratic women remains flat or even declines, the need for our work is growing. • Questionnaire & Endorsement Process & much more! Our intensive, cohort-based, seven-month training program is unique. We provide more than just training; we provide the support, encouragement, and inspiration to succeed. Our trainers, staff, Board, program members and alumnae bring deep and diverse knowledge and experience to each training. Once you complete this training program you will be added to our network, have access to our trainers, alumnae, board and larger network raising your profile all over the state of Maryland! The Emerge program is the essential step for Democratic women who are planning on running for public office but do not necessarily know where to start. Because of the generosity of people like you, we have never had to raise our tuition in the more than 5 years we have been offering this program to women across the state. Help us keep our tuition low so that more women can take their seats at the decision-making tables in Maryland. Please, consider making a monthly donation of $15 or more. The dedicated support of people like you will allow us to bring women together, every year, and train and inspire them to run for office. Together we must continue to flood the ballots with women ready to win at all levels because when progressive women are elected, we all win!